Please see our player page for Logan Forsythe to see projections for today, the next 7 days and rest of season as well as stats and gamelogs designed with the fantasy baseball player in mind. Let’s be honest, the final week of the regular season can be a total crap shoot. This is the reason you don’t have H2H finals the final week of the year. Oh, you do? Well, you should give your commish a firm kick in the arse and tell them to get their head out of there ‘cuz that’s crummy with crackers. It’s for this same reason that cash games in DFS the final week of the season are a no-no. GPPs though, go for it. I’m basing my calls this week on pure narrative. The narrative for James Paxton ($19,600) is finishing the season on a high note and not finishing on the DL for once. The Rangers have been coasting the final month of the season, ranking 22nd in team OPS the final month. I’ve been picking on them plenty with pitchers of much less talent than Paxton. Paxton is my top choice over Kluber, who will likely only see a few innings and Nola, who is facing the Braves who still have something to play for. If you like a different narrative though, by all means, I’ll meet up with you in Narrative City. New to FantasyDraft? Scared of feeling like a small fish in a big pond? Well be sure to read our content and subscribe to the DFSBot for your daily baseball plays. Just remember to sign up through us before you do. It’s how we know you care! New to FanDuel? Scared of feeling like a small fish in a big pond? Well be sure to read our content and subscribe to the DFSBot for your daily baseball plays. Just remember to sign up through us before jumping into the fray. It’s how we know you care! The Other NY Team Scored 24. Did Anyone Phil-Met? What’s up everybody! 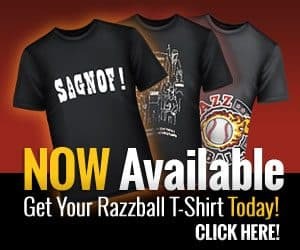 I’m excited to be back for another season of DFS here at Razzball, and I’m even more excited to be covering Draft.com! And I’m even MORE excited for this Hot Pocket I have in the microwave. Only thirty more seconds! Anyway, Draft.com is a super awesome way to play DFS because (spoiler alert) you get to draft your players! So, let’s get into some picks. The first guy I’d like to highlight is Corey Kluber. You’ve got a few options at SP to go with early, but I like Kluber the most because, well, he was the best pitcher in all of baseball last year. I’m not always one to take a pitcher early, but if you can get another eight inning, eight strikeout, one earned run start like the one Kluber put out last time, you’re gonna be well ahead of the competition. If Klubot was playing Draft, he’d probably pick himself, and he’s a robot, so he knows more than me.